Guest posting is something that is working for me. I have written guest posts for other blogs and I have had guest posters on my blog. There are benefits to both and it can be a lot of fun! I have guest posted a few times and really enjoy it. I get to write for a different audience than my own blog and sometimes I get to talk about a subject that I don't always address on my own blog. It's fun to use my own voice, but fit my content to the style and subject matter of the blog owner. If done well, new people will stop by my blog - bringing not just more traffic, but the possibility of new friendships! And if I promote the guest post on my own blog, then I help bring new traffic to the hosting blogger. I recently had a week of guest posters on my blog. I enjoyed the mental break - it was so nice to put up great content written by somebody else. The guest posters had some fresh new material for my blog and brought some new readers along with them. My readers got a taste of some of my favorite bloggers and had new places to go visit! How do you find guest post opportunities? Bloggers will often ask for guest posters when they are going to be gone or just need a break. Sometimes you may be asked specifically; other times a general request is given on another blog. If it's a friend or a blog you read, you should definitely offer to do a guest post. You can also offer to do a guest post for a blog by giving them an idea that you have and why you would like to guest post. They might take you up on it! How do you find guest posters? Ask your friends and favorite bloggers if they are willing and have the time to do one for you. You can also put a request on your blog and/or other places like Twitter. You might be surprised by who responds! There is some etiquette to follow when guest posting. Problogger has a very helpful article about how to be a good guest blogger. Have you written some guest posts for blogs? 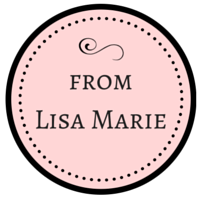 Have you had guest posts written for your blog? What are your thoughts? 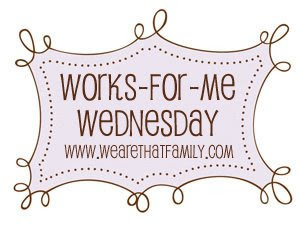 Stop by Works-For-Me-Wednesday at We Are THAT Family to see what's working for everybody else! I did guest post once but I don't know if I'll do it again because this person took a lot of my friends and is now threatening to pass me up in followers! LOL. I loved guest posting for you my friend. It was great fun. Ask me any time!! Big I got nothing to insert here size hugs to you! LOL. The mind just went blank my friend. Haven't finished my coffee yet!!! This is a great idea...I need to consider this for when I need a break. 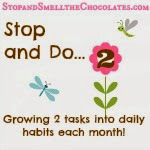 I love the idea and would love to post on more blogs. My sister and I have posted on each others blogs and have recently invited Laura as a guest writer for an upcoming post for The Daily Mercies. Stay tuned! Great post my friend! 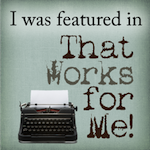 I enjoyed being a guest on your blog and having a guest on mine. Maybe I'll do that again soon! Oh this sounds very cool......I would def. be interested. I'd never considered guest posting before but it sounds like fun and a good way to meet new friends. Seems like a no-brainer to me yet the thought never occurred to me! I am going to start looking for opportunities to do this. Let me ask your opinion - if you comment frequently on someone's blog and you are on their blogroll, do you think there's good value in being a guest poster for that person, seeing as there are already opportunities to link back to me via comments, etc.? Or do you consider this to be a good place to begin? You are so cracking me up with following your blog my friend. I did that and forgot to get off because my feeder was messed up and I had to see when my posts were being published. LOL. As least we are together!!! LOL. BIG side by side hugs to you! I did a guest gig on 5 Minutes for Mom's Tackle It Tuesday. I also am a regular contributer to Happy to be at Home and a blog with friends. I like that each opportunity allows me to explore a different side of myself in a different voice.